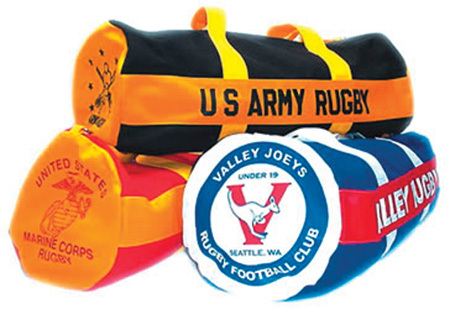 These large, hard wearing traditional rugby duffel bags are made with tough 18oz canvas and are big enough (27”x13”) for all your game gear with room for party clothes too! This bag is well made with quality materials and carries a 4 year warranty from the manufacturer. It features a shoulder strap and carry handles. It is easily personalized with club crests, player names and numbers. The price includes all basic artwork, set up fees, and end logo prints in one color, name on one side, club or tour name on the other and a shoulder strap. No HIDDEN or ADD ON CHARGES. Minimum custom order is 12. Available in most team colors. Artwork for end logo prints must be a high quality image or additional design time may be charged. Please see our artwork specifications for more details on preparing your files.